For an episode that was filled with returning stars and guest stars, I don't think "Chuck vs. The Cubic Z" was as good as it could have been. With the first Big Mike sighting of the year, along with Stone Cold Steve Austin and Nicole Richie, this week could have been better. Having said that, there was still a ton to get excited about. I mean, it was Stone Cold Steve Austin! 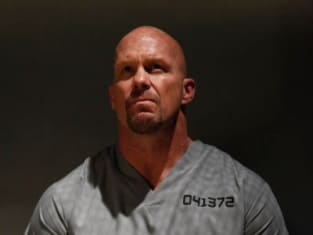 As a 1990s wrestling fan, I both automatically loved his appearance, and spent every minute of the episode hoping that he would dish out the Stone Cold Stunner on somebody. Richie would have been the most enjoyable victim. Although there were no wrestling moves, there was still plenty of action this week. There were a couple of great Chuck versus Hugo battles, both of which came in interesting environments. Fighting in an air duct and then in a cage gets them the creativity award for the night. But for pure adrenaline? That's all Sarah and Richie's Heather. Of course, it wasn't as good as the locker room fight from a few years back, but these two know how to battle. Here is where the episode was let down this week. There wasn't that much comedy to take in. The best lines of the night came from Richie, whose interest in Chuck and Sarah's relationship was surprisingly funny. She might not know exactly who Sarah is, but she does have Chuck pegged, "Thanks for that, movie dork. I bet you have like a Tron poster in your room." Yes, he does Heather. Nice call. The Buy More trio didn't have the stuff this week. They were throwing fast balls in the 80s out there. Lester and Jeff are best when they don't care about anything, so when they took an interest in helping with the sale of the video game, they lacked their Jeffster! attitude. Lester's poetry, and Jeff's karate moves, were both lame and not humorous. There sure were a lot of heartfelt moments this week, and they came from many different sources. Of course, there is always the Chuck and Sarah exchanges, this time being pushed by Heather's infatuation with Sarah not being the "settling down" type. The two love birds deciding to take things slowly just before the end of the episode was a nice touch. But how about Sarah and Casey? This is a talking relationship that we have really yet to explore. On two occasions in this episode they discussed their problems with Chuck and Alex, respectively. The fact that neither of them are very chatty made for some interesting and funny interactions. Most chill-worthy scene, though, had to be Morgan and Big Mike's moment. Morgan giving Big Mike both the Assistant Manager vest and his blessing to marry his mom was a very touching moment. The Bearded Wonder, for all of his ridiculous antics, has quite the softer side that came out in full force this week. So before they shipped the prisoners off, Heather gave Chuck and Sarah some useful information on Volkoff and Frost, which should help Chuck find his mother. Hopefully, this leads in nicely to the next episode being more heavy on the "Chuck searching for his mom" story. How about that ending, though?!? It was hilarious and gut-wrenching at the same time. As we watched the ring falling through ducts, I kept wondering how it all was going to play out. Once it fell and Chuck picked it up, I couldn't help but laugh at the situation. But how will they deal with this circumstance at the start of the next episode? Will Chuck propose? Does Sarah think he's proposing? It should be interesting. Any time you can put Morgan in a new situation it's a win. Him as a worried Buy More Manager? Yes, please. Is there a purpose to the Greta role other than to bring in new hotties and guest stars on a weekly basis? I already mentioned that I thought Heather was funny tonight, but I really enjoyed how they used her interest in our favorite couple as a way to move along the fact that Sarah isn't interested in settling down. Way to go Big Mike. In his first day back, he becomes Asst. Manager, gets to propose to Morgan's mom, saves the Buy More riot and takes down the bad guy. What a day. Sarah referring to Devon as Awesome, is, without a doubt, AWESOME!